Originally posted in 2011, this review on “Battleground” and is now repurposed for the William Wellman Blogathon. Brief plot: The film depiction of the 101st Airborne Division when they are trapped in Bastogne during the Battle of the Bulge. The division is surrounded by Germans and unable to get any air support due to heavy fog that lasts for days. 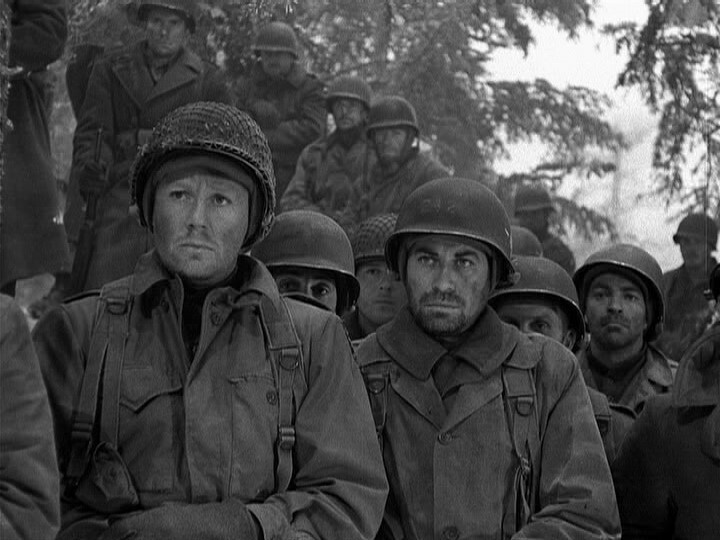 The World War 2 film has a star-studded cast with Van Johnson, John Hodiak, James Whitmore, Marshall Thompson, Riccardo Montalbon, George Murphy, Don Taylor and Leon Ames. I originally saw this film when I was in high school-the sole reason I wanted to see it was because of my insane crush on Van Johnson. But as I watched it, I feel in love with the script, the way it is shot, all of the characters and the tone of the film. Accuracy: World War 2 is my favorite period in history-the way the whole United States bonded together in a way that we will most likely never see again. I really like war films made during war time, but there is a certain amount of patriotic propaganda mixed in that makes war time battle films not as credible-I’m not saying I like them less for this, they just generally aren’t as historically accurate. I also enjoy several war films made in the 1950s and 1960s, but they also have their own historical inaccuracies. The hairstyles and dresses are usually 1950s or 1960s styles, rather than 1940s styles. An example of this is Gina Lollabridgda in “Never So Few.” Her outfits are all wrong for wartime-let alone for a woman living in war torn Asia. “Battleground” is made just soon enough after the war to be patriotic, but also very accurate. I’ve heard that it is one of the most accurate war films of the Golden Era- depicting conditions and sentiments of the soldiers. I would like to clarify that I say its the most accurate WW2 depiction of the Golden Era, because I realize that in recent years, films like “Sands of Iwo Jima” and “Band of Brothers” have given a better historic account of the events. Filming: I love the way this film is shot. The darkness of their uniforms against the snow and fog that lead the soldiers to be trapped in Bastgone is perfect. There is almost a grittiness to it too. 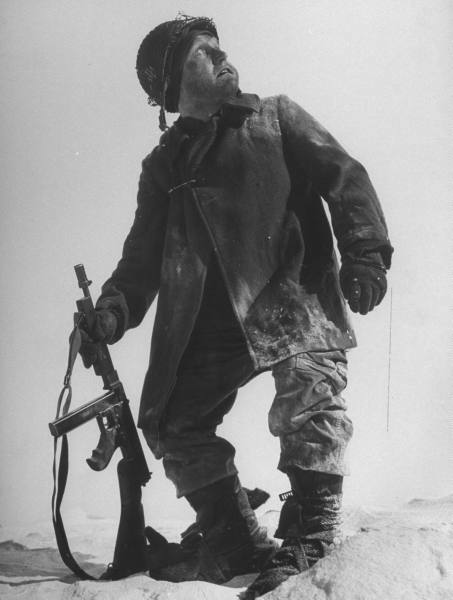 Though the snow is pure and white, it is ugly and dangerous because the reason why they are surrounded and with no help from air support. William “Wild Bill” Wellman directed the film, and this might have alot to do with the gritty feel of the film. Cast: Look at the actors I listed above. Could you ask for a better cast? Sure, none of them were ever as big as Clark Gable or Spencer Tracy, but they were all amazing actors. I really think this film helped both John Hodiak and Van Johnson flex their acting muscles better than fluff films they were in before. I also love Marshall Thompson’s performance. 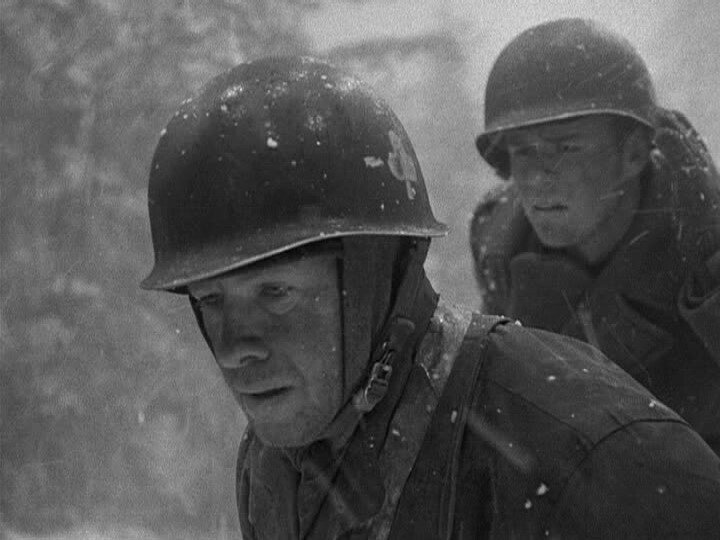 He starts off as a young kid, eager and excited to fight, but as the situation in Bastogne gets more serious, he becomes bitter. Script: I enjoyed the story line, but I also liked the little Army jokes or lingo they used. For example, whenever they were talking about the Army, they had an ongoing joke of “I found a home in the Army.” Or how they called bombs “In-coming mail.” Though the film is only 2 hours and doesn’t give us enough time to really get to know the characters, we learn their personalities enough by things they say or sing. The country character, Abner always says “That’s for sure, that’s for dang sure” and butchers the name of Bastogne calling Baaast-oog-nee.” Another example is John Hodiak’s character is well spoken, educated and was a newspaper man. Douglas Fowley, who plays Private Kippton, always clicks his false teeth in the film-something he really knew how to do in real life and it added a bit of his personality to the script. 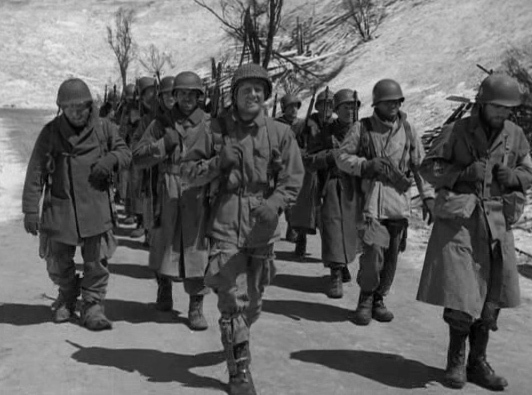 Another thing I like about the film is that the screenwriter actually fought in the Battle of the Bulge, so he had some knowledge of the events. Things like Ricardo Montalbon’s character never seeing snow before and getting excited, isn’t just hokey Hollywood glitter-it actually happened. To Review: This film was made at a time that MGM was switching from L. B. Mayer to Dore Schary as studio head, so it’s a little different from the frothy MGM movies we are used to. Though I realize there are several World War 2 movies, more realistic than this one, “Battleground” is my favorite war movie. I think this film was made at the right time, giving the U.S. a few years to recover from the war but also before the downward spiral of the communist scare began.